King Zog is married to my cousin, Hungarian-born Queen Geraldine, hence my attendance. At six I am fully prepped for the guests and keep my mouth shut. That is fine, however, since Zog, a thoughtful man, joined me in the palace gardens several hours earlier to chitchat. He asked about the ups and downs of my life in Cairo and injected some gentle humor. A calm and kind man, he made people of all ages feel special. Tonight the guests are departing early knowing that Farouk is eager to play cards with Zog. During the summer months, Farouk arrives unannounced at least once a week to gamble. Zog adapts to these visits with grace knowing he is under the protection of the Egyptian monarchy. I start moving towards the door with my parents to head up to our room. All of sudden Farouk turns to me smiling and says “the little one will sit next to me and bring me luck.” While there are less attractive sides to the king, he is kind to children and has a sense of humor, so I join him willingly. For the first hour, I watch him play and we grin at each other as he rakes in the coins. Then I stretch out over his ample lap and fall asleep. Sometime in the wee hours of the morning, he gently shakes me. “We have done well, ma petite,” he whispers in French, “now you will share my earnings.” I hold up my white pinafore and he fills it with mountains of bills and coins — the equivalent of several thousand pounds (1 pound in those days was worth about US $5). I thank him and head out trying to keep the dozens of menservants standing in the hallway from dipping their hands into my bounty. Upstairs, my parents stare at the pile in shocked amazement. The funds will keep us afloat for a number of months!! As Hungarian refugees who arrived several years earlier, life in exile is interesting but not always easy. More details will follow in future blogposts. LESSON LEARNED: It’s not who you know, but how you get to know the person that produces dramatic results — especially if you are six years old and you fall asleep on the King’s lap. Shoya — what a fabulous story. No wonder why you’re always so interesting! Truly, with your experiences, you are well equipped to help people understand themselves and others. Recently was in Egypt and saw King Farouk’s tomb. Shoya tells a fabulous story that puts texture to a man I know little about but want to know more. Thank you. Loved reading this story. What an interesting experience for a six year old! You have so many interesting stories! Hope to hear more. No wonder you have such exceptional insight! Thanks Janet. It was indeed an interesting period. More to come! Thanks for sharing a fantastic story. 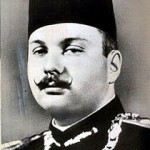 While you attribute great kindness to King Farouk, you underestimate your ability to engage people. Maybe this is the start of your keen interest in helping other people succeed? Thanks for Mary for the nice comment and interesting idea. Farouk’s circle would chuckle. While he was amusing, he was very self absorbed! But then life works in mysterious ways.